The upcoming series of sequestration cuts will cut $1.2 Trillion over the next 10 years, with $85 billion kicking in for FY 2013 on March 1 and $109 being cut annually moving forward. Industry groups worry that the cuts will emaciate industries already hamstrung by the recession, the Congressional Budget Office reported that the austerity measures could initiate a recession, and members of Congress who voted for it are furiously fighting back against debilitating cuts in their district. Following the cuts, Air Traffic Control towers will be understaffed, the price of groceries could jump following USDA inspector furloughs and the criminal justice system will move at a slightly slower crawl due to staffing cuts and court closures. Even popular programs like NASA see a hit. Needless to say, the cuts will take a major bite out of many services that are crucial or popular for many Americans. But what’s especially striking — and sad — is how very little the cuts accomplish in the grand scheme of things. 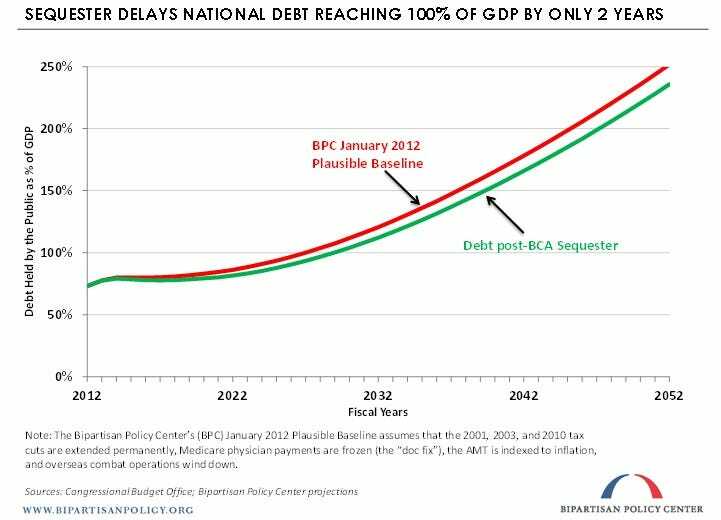 The Bipartisan Policy centre prepared this chart last year once the full impacts of sequestration were fully understood. It’s worth revisiting now, nine days out from the implementation of the cuts — to get a sense of what the country is really getting in exchange for austerity. 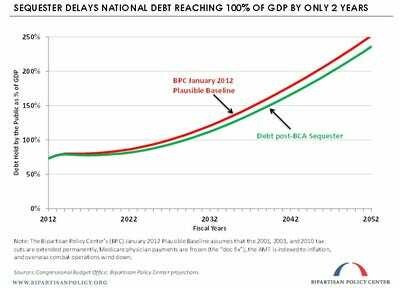 Sure, there’s a delay in how fast the debt rises as compared to GDP, but virtually no change to the trajectory. Bottom line. Not only will the sequester hurt, it won’t even accomplish any real goals.